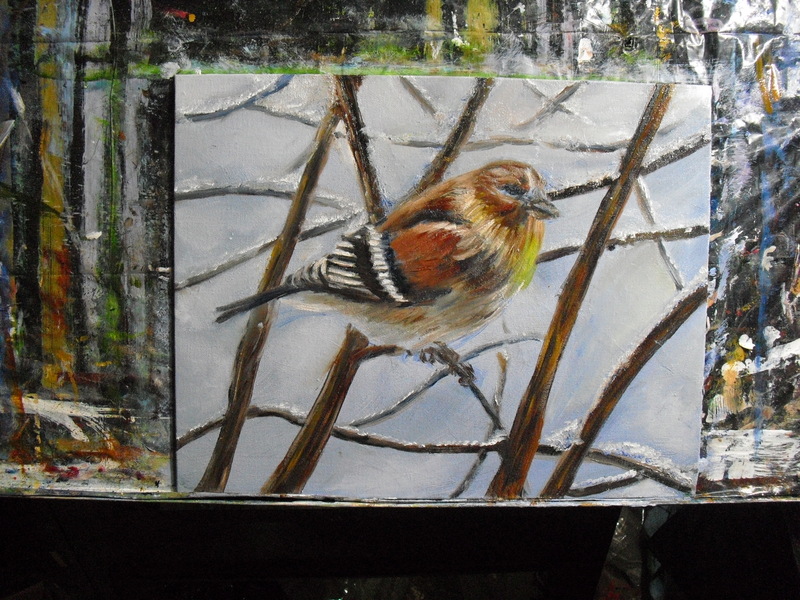 Today, I’ll share the next steps in creating a finch painting in oils. 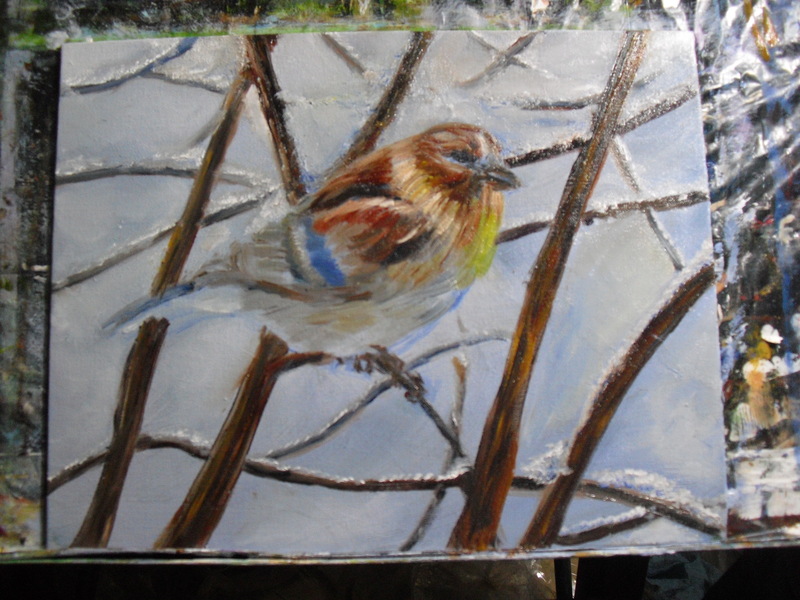 I now start adding more darks and lights to the background, defining the branches and the snow behind the bird. This will get reworked. I mix the snow hues with ultramarine blue, cobalt blue and titanium white, with a hint of burnt sienna; in the sunny areas, I add a touch of cadmium yellow light and more white. The branches are getting thicker and more defined now. Now for the next step: working on the body of the bird more. 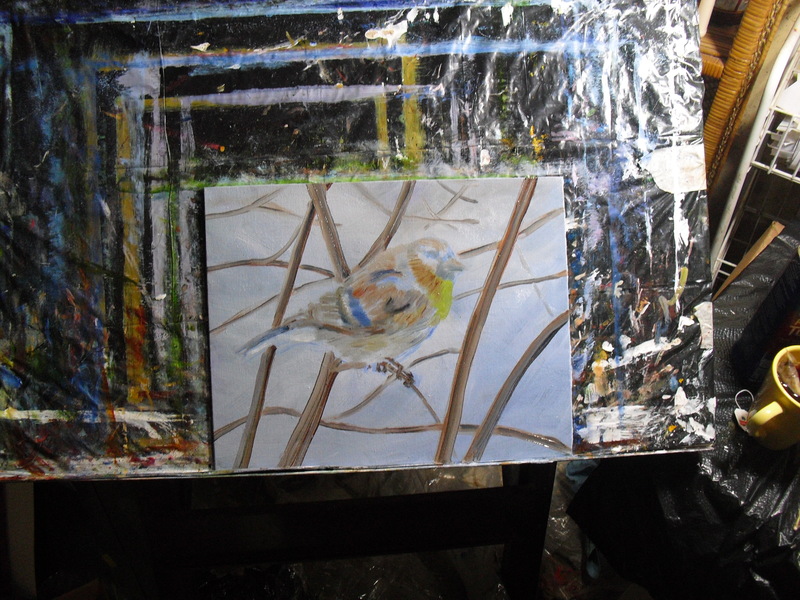 In this stage, I add burnt sienna mixed with ultramarine blue to the body and head; and create cream colors with the above plus yellow ochre and white; I start at the front of the bird, and work my way down the body. At this point, the painting looks “gaudy” because I have yet to tone down the bright colors with shadows and highlights; these will come later. My main goal is to show the roundness of the body, and the feather patterns. Okay, it’s starting to look like a bird amid snow-covered branches. At this point, it’s got lots of nice color; that’s part of the fine, trying out different colors and combinations. I could stop at this stage, but I like a lot of depth and realism and fine detail, so I’ll keep going. In a few days, I’ll share the finished painting. Let me know how your painting progresses! This entry was posted in art instruction, art lesson, art tips, artist, finch, oil painting and tagged art instruction, art lesson, art tips, artist, bird painting, oil painting. Excellent! And thrilling as well!